I saw Omega plums advertised on the main street in Greytown in the Wairarapa. It’s worth the short detour to Murphy’s orchard as their plums are picked perfect, sweet and prolific. Particularly if your husband tells you that his third favourite jam is plum jam (behind blackcurrant and apricot). Omega plums are ruby red all the way through which give the jam a wonderful colour. I referred to ‘Let’s preserve it‘, a classic 1970’s recipe book reprinted in hardbook last year. It appeals to me as it’s in a small format and arranged alphabetically (no index required). It includes plum cheese, chutney, conserve, jelly, pickle and marmalade, as well as several plum jam recipes. It could also tell me plums are a medium pectin fruit so I added some lemon juice and got an easy and quick set. Also helped by only using a kilo of fruit so could get a good rolling boil “boiling so hard it spits”. Makes six small jars. Mix the sugar and fruit together in a non-metallic bowl and leave overnight until the juices run. 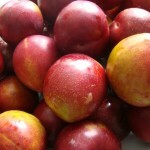 Put the plum stones in a plastic bag on a chopping board and tap them with a rolling pin until cracked. Remove the kernels, add to the jam and discard the shells. Heat the fruit, sugar and lemon juice gently in a preserving pan until the sugar dissolves, stirring until you can’t see sugar crystals on the back of the spoon. Bring to a rolling boil until the jam starts to thicken (mine took about 20 minutes). Test by putting a teaspoon of jam on a chilled saucer. When it’s cold push your finger across the surface and if it wrinkles it’s ready. If not, reboil for another five minutes and test again. If you use a candy thermometer it should read 104 degrees C (mine set before it reached this though). Bottle while warm (but not hot) in sterilised jars.